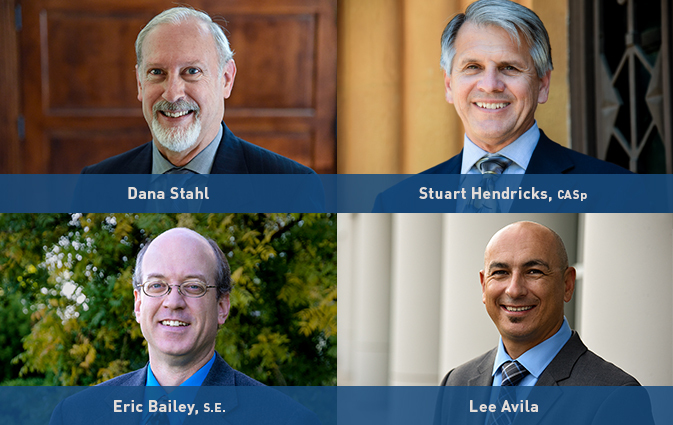 TETER is pleased to announce the promotion of four TETER staff to “ASSOCIATE” status: Dana Stahl, Stuart Hendricks, Eric Bailey, and Lee Avila. Dana Stahl, a licensed architect with over forty years of building design experience, is an invaluable resource. As a new Associate, Mr. Stahl will further leverage his knowledge to benefit clients and staff. His promotion provides new avenues for Dana to deliver high quality project management and building design to clients. Stuart Hendricks, a licensed architect and a Certified Access Specialist (CASp), has provided technical knowledge in construction documents, code compliance, and disabled access for over twenty (20) years. Continually improving the process of creating quality construction documents will be Mr. Hendricks’ focus as an Associate. Eric Bailey, a licensed structural engineer, is the “go to” structural expert for designing public education buildings. For almost twenty (20) years, K12 clients and contractors have relied upon Mr. Bailey’s budget-conscious structural solutions for their facilities. Lee Avila, a licensed architect with an emphasis in healthcare, has worked with hospitals for twenty (20) years to design their medical facilities. Mr. Avila, who is based out of TETER’s Modesto office, offers specialized healthcare design experience. His promotion to Associate enables him to mentor and provide higher-level leadership to staff. TETER is celebrating our 39th year of providing quality architectural and engineering design services. The expanded leadership team and promotion of the four (4) staff members ensures that TETER will continue to “build a better valley” for generations to come.